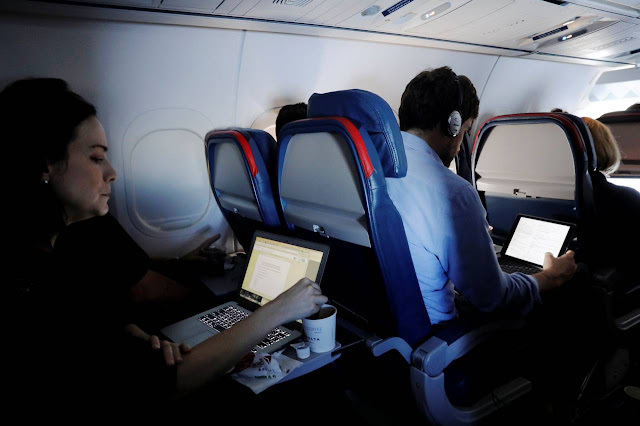 Airbus SE , Delta Air Lines Inc., Sprint Corp. and two U.S. satellite-services providers have kicked off an initiative to enhance internet access on airliners, inviting other companies to join voluntary efforts to upgrade global standards for airborne connectivity. That's nice, but useless. In those wonderful Economy seats (better known as steerage) it goes like this - Once you cross 10,000 feet you bend over to get your laptop out from under the seat but your head hits the back of the seat in front of you. Then you turn sideways and reach down, trying to ignore the pain in your side as your muscles cramp up. Finally you get the laptop bag out and try to get the laptop out without knocking the guy in the middle seat unconscious. Extracting the laptop, putting the bag back, and trying to get the tray down in one move without knocking out your teeth should be a new Olympic sport. Finally you get the laptop in place and the dude in front reclines his seat. Now when you open the laptop the top of the screen is stuck in your chest where you can't see it unless you scrunch way down. Meanwhile your arms are jammed in the back of your seat making typing hopeless. So why do I care about better WiFi again?